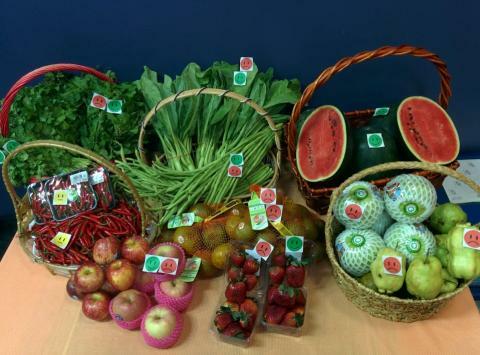 The foundation tested vegetables from 14 supermarkets in Bangkok for pesticide contamination. The 14 samples included cabbage, Chinese cabbage, Chinese broccoli, yard beans, morning glory, parsley and bird chilli peppers (also known as "bird's eye chillis"). The quality of seven of the samples was certified by the Department of Agriculture, while the rest were house-brand vegetable products. The samples were tested by the Public Health Ministry's Medical Science Department in March. It was found that five samples - Chinese broccoli, two samples of yard beans, parsley and bird chilli pepper - were tainted with harmfully high levels of pesticide. The parsley and yard beans were found to contain pesticides at a level that exceeded European safety standards. Parsley sold at Siam Paragon Department Store's Gourmet Market was found to contain Chlorpyrifos at a level of 0.84 milligram per kilogram. Under the European Union Food Standard, Chlorpyrifos should not exceed 0.005 milligrams per kilogram. However, Thai authorities do not designate a standard for Chlorpyrifos contamination in food products. Exposure to high levels of Chlorpyrifos, which is used to control many different pests, can cause runny nose, tears and increased saliva production or drooling, headache, nausea, dizziness, vomiting, abdominal muscle cramps and loss of coordination. Yard beans produced by Doctor Company were tainted with Carbofuran at a level of 0.007mg per kg. The EU prescribes a safe level of Carbofuran as not exceeding 0.02mg per kg. Thailand National Bureau of Agricultural Commodity and Food Standards designated that the level of Carbofuran in food products should not exceed 0.1 mg per kg. Carbofuran contamination causes symptoms such as nausea, dizziness, confusion and at very high exposures can case respiratory paralysis and death. Foundation for Consumers manager Saree Ongsomwang said her agency would send the results of the tests to the Food and Drug Administration and urge it to call on food producers to improve their product quality. Meanwhile, Vitoon Lianchamroon of the Biothai Foundation has demanded the government ban four pesticides - Carbofuran, Methomyl, Dicrotophos and EPN - for use on agricultural crops, as the pesticides pose serious health risks to people. The pesticides are banned in the European Union, US, United Kingdom, Finland, Singapore, India, Pakistan, Vietnam, and Myanmar. Vitoon said there had been an effort by a large pesticides importer to force the Agriculture and Cooperatives Ministry to register Methomyl and legally import it for widespread use in this country. "Allowing these pesticides to be used in the country puts people's health at risk," he said.